Found a Big Living Horse Conch, Exciting! While out on the boat just the other day we were fishing the backwaters north of Mosquito Lagoon. It was low tide and my son wanted to fish in Oyster Bay because the oyster mounds would be easy to see and navigate. As we entered the bay area a large area of very shallow water allowed us to see the sand through the clear, running water. We all noticed, what looked like, a large shell just beneath the surface. 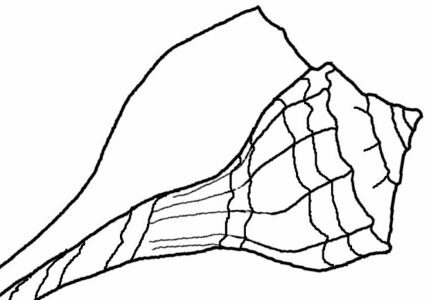 I know that the horse conch can grow to be around 2 feet long, and certain other whelks can also be quite large. So we trolled over to the edge of the sandy island and hopped into the water to investigate. The elongated shape of the shell told me it was a horse conch, and with just a little of the orange part (the mollusk’s body) showing, I knew I had found a living horse conch! My son held the heavy shell for a moment so I could get this photo and we put it right back down onto the sand. I couldn’t measure it, but I am guessing it was around 14 inches long. Here you can see the operculum (round hard disk) which closes the mollusk in, and his bright orange body. It’s such an amazing creature! They like sand, and this area is nothing but sand, so I’m sure he’s very happy traversing the inland waterways. It’s not unusual to find little crown shells, lightning whelks and other pretty shells “walking” around on these sand bars. They are never living mollusks, only empty shells taken over by the hermit crabs. So, finding this big living mollusk was an exciting experience for me. That find alone made my day, but later on we found another living horse conch on the same type of sand bar! It was about the same size as the first, and was up out of the water and encrusted with barnacles. I didn’t touch the second one, or take a picture, but I could see his orange body down in the mud. (I am always afraid I will drop my cell phone while walking through the squishy muddy, and sometimes slippery, bottom.) Plus, I already had my photos. According to my seashell reference book, Florida’s Living Beaches, the Florida horse conch is “relatively uncommon” along the east coast. I’ve never seen one along the shore or at the beach, and I’ve only found 3 in my travels in the backwaters. They are however, “relatively common” on the southern west coast of Florida, where I imagine beautiful large and juvenile empty shells wash up on the beach. Over here where I live, it takes a bit more searching to find such a wonder. We left him on his sandy island, awaiting the return of the tide, and trolled off to try and catch some fish. That is one hell of a big conch shell! And alive, too! Great find!